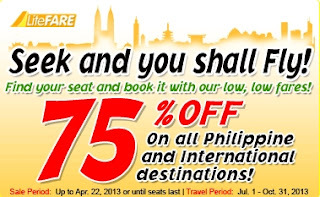 Up to 75% discount on Cebu Pacific base fares. That's the latest promo offer from the country's largest airline. The travel period is from July 1 to October 31, 2013. The promo is open for both domestic and international destinations. Tickets can be purchased online at www.cebupacificair.com or at any Cebu Pacific accredited payment centers. The promo is available until April 22, 2013 or until seats last. Please take note that base fare is exclusive of fuel surcharge, terminal fee, baggage and other charges. With that the final fare might be larger that what you expected.